AMC’s had a host of fantastic shows over the years, highlighted by addicting dramas Breaking Bad, Mad Men and The Walking Dead. 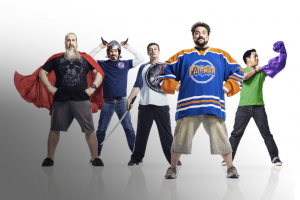 If those somehow don’t quench your tv thirst (and we’d say you’re crazy if they don’t), there’s the unscripted reality show Comic Book Men. Comic Book Men is set at Kevin Smith’s (both known for writing, directing and starring in the likes of Clerks, Dogma and Mallrats) comic book shop in New Jersey – Jay and Silent Bob’s Secret Stash. Naturally, comedy ensues. Comic Book Men airs Sunday’s at midnight on AMC. For more information, check out Comic Book Mens website.